Fine spring sunshine and warm conditions greeted all those who took part in the first event of the Gwynedd Cycling Association 2016 series, but conditions were not perfect with a stiff north easterly breeze making the outward leg of the Aberdesach/ Llanwnda/Aberdesach course quite testing. However all the competitors rose to the challenge and produced some excellent times for this course, and so early in the season. Thirteen teams faced the time keeper, some of them old hands at this discipline, but many of the competitors having never ridden in such an event before. 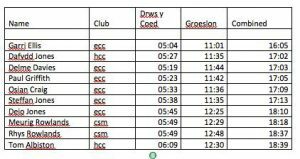 Each year Club members compete in a series of open time trial competitions organised by Holyhead Cycling Club, Clwb Rasio Mona and ourselves. During the 2015 season it was five events, of which four events counted for the overall awards. In recent years riders from Energy Cycling Club has dominated this series, and once again the racing members within the Club haven’t disappointed. The Club’s riders have won “The Team” title again. The 2015 season saw some new faces come to the fore, and there’s been some shuffling of places at the top of the overall placing. The young up and coming members have shown what they are capable of, and will prove their worth in the coming years. Last Sunday saw a full field of riders face the time keeper in the Welsh National 10 Mile Individual Time Trial Championships, promoted by Pontypool Road Cycling Club on the Abergavenny to Raglan course in South Wales. Energy Cycles Junior Road Team members Jack Williams and Huw Owen, along with Club members Alun Williams and Garry Ellis took the trip south to test themselves against some of the best riders in the country, and they didn’t come away disappointed.